After a lovely few months off with my new daughter Lottie I’m slowly getting back into the wonderful world of food… I have to admit, my culinary escapades have been few and far between since she was born! However, over the past few months I’ve been preparing for the BBC Good Food Shows that are currently taking place in Glasgow (last week), London (on now!) and in Birmingham on the 26th November – they are as incredible as always! I hope you’ll be able to visit these fabulous producers at one of the BBC Good Food Shows! This past year or so has been a bit of a whirlwind… a move from London to North Norfolk, buying my first house and becoming pregnant with my first baby! So excuse the lack of blog posts – I hope my twittering has kept you up to date with my food finding activities! So… I’m now in the midst of the busy but brilliant ‘show time’, where the BBC Good Food Shows comes to life in Scotland, London and Birmingham. While at the shows I look after the Producers Bursary Award winners, the BBC Good Food Champions area and also get involved in other fun bits like interviewing celebrity chefs in the VIP lounge and the show’s official blogging community too. I first visited a BBC Good Food Show back in 2006 and after visiting I wanted so much to work on the shows! So the following year there I was at my first BBC Good Food Show in London, so the show taking place this week at Olympia is very close to my heart. I’ve just about recovered from the BBC Good Food Show Summer – as ever it was an awesome show, with well over 100,000 food and gardening lovers coming through the doors! I’m still buzzing with inspiration after meeting so many fantastic producers, chefs, bloggers and food lovers during the show. Here are a few of my highlights, I’m afraid I was having too much fun to take many photos so you will have to use your imagination for some of it! As part of the show team I get backstage access so on Emily Cloke‘s birthday we took some Ooo Meringues behind the Belling stage and ate them with the lovely Simon Diss… then along came Rachel Allen who is even more beautiful and lovely in real life as she looks on the TV! The Midlands’ Best Street Food! I’ve been delighted to be involved in the BBC Good Food Show‘s search for the Midland’s Best Street Food, and so excited that the winners have now been announced! I haven’t yet tried food from any of these amazing sounding vendors so am really looking forward to lunching with them at the upcoming Summer Show! They were all mystery shopped by the BBC Good Food Shows’ Midlands Blogger Community, so we know they are of the highest quality in terms of product, service, use of fresh, local ingredients and creativity. So that’s four days of lunches sorted! I cannot wait to meet them and find out more about what they do. Look out for them outside of the halls amongst the RHS show gardens, you may just see me there! Oh, and if you would like 15% off tickets just quote KT15 either on the phone or in the promotional code box! This food find was delivered to my desk and there is no doubt that this is the tastiest thing I’ve eaten in ages! Well Seasoned won a bursary to attend the BBC Good Food Show London last year and I’m so glad to have found them, and that they sent me their latest delicious Spring flavours! From a brilliant blog based on seasonal food and cooking Well Seasoned was born – versatile pestos/dips that change with the seasons. 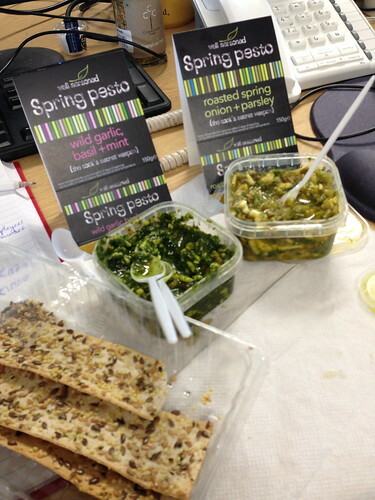 The new Spring flavours are stunning – wild garlic, basil and mint which was gorgeous in colour and packed full of flavour and roasted spring onion and parsley which was rich and again had an incredible flavour. Both pestos tasted so fresh and not only could you identify the different ingredients by looking at it, but you could taste all the ingredients too – cobnuts, rapeseed oil, cheese and the seasonal additions. In keeping with the ethos of seasonal and British, Well Seasoned use Kentish cobnuts, extra virgin rapeseed oil and Old Winchester cheese in all of their pestos. The ingredients change with the seasons so back in the Winter (yes I know it seems like we are still there with the bitter cold at the moment!) their flavours were roasted parsnip and thyme and caramelised shallot and rosemary. Take a look at their website to see the other flavours, and be sure to check out their summer flavours when they launch. You can buy from Partridges in London or a box of 6 online for £19.50 + £3.50 postage (don’t worry they freeze really well). I ate mine at my desk for lunch two days running… on Ryvita thins, with bread, stirred into plain pasta and on its own too! So worthy of being my food find of the week! Last weekend I was up in Glasgow for the BBC Good Food Show Scotland. I think most will agree it was one of the best shows yet with a great celebrity chef line up, including the lovely Hairy Bikers, and an even better selection of speciality, artisan and passionate producers from across Scotland, the British Isles and the world! It’s our London show next week (9th -11th at Olympia) so I’m super busy getting ready for that… but here is a quick run down of my highlights in pictures. Just click on the post title if you can’t see the images! The show started with a bang as Paul Hollywood and Mary Berry opened the show – after the ribbon was cut thousands of food lovers burst into the show to start their fabulous food experience! It’s a great sight to see, and always gives me goosebumps as the show officially comes to life. Borders Biscuits were asking visitors to decide whether their new Christmas spiced biscuit should be put into mainstream production. We put our deciding token into the ‘Oh Goodness they’re yummy’ box! Whole Foods Market Glasgow were sampling and selling sourdough loaves, giant meringues and Prosecco! Have you tried Boozeberries liqueurs? Fresh berries inside gorgeous Irish artisan fruit liqueurs… I’m going to be buying some at the London Show for adding something special to sparkling wine at Christmas. A quick break for delicious fresh cream filled meringues and scones from the Dancing Goat! Mo and her Cookie Dough! Morag was one of our bursary winners and did a brilliant job of making the most of the opportunity to appear at the show! Mr Puddledub Buffalo giving out advice on how to cook his fresh buffalo meat. A quick stop backstage led me to bump into the Hairy Bikers – Si and Dave look great after their dieting and I must say Si looked like a rock star with his skinny jeans! What is your Christmas meat of choice? A Taste of Galloway were sampling their succulent goose, which is a lovely luxurious way to celebrate at Christmas. We paid a visit to have a well deserved glass of champagne at the end of the day on Saturday – cheers! We even had a shark! Only a lucky few of us get to go up and work at our Scotland Show – so the team back in Teddington were delighted that we brought back a range of flavours from the wonderful Ochil Fudge Pantry! I think my highest highlight was walking Mary Berry around the Producers’ Village before the show opened, she was so enthusiastic and interested in the producers and produce! And now its on to the next one – London is next week, and then our flagship show at the NEC is on the 28th Nov – 2nd Dec. See you there?! Producers Bursary Awards – The Winners! I’m so excited to announce the winners of the Producers Bursary Awards! They have been through a rigorous application process and will soon be appearing at at BBC Good Food Show near you! Gusto – handmade dressings, marinades, sauces, spice blends, oils and infused vinegars made in Edinburgh less than 1 year old. Mo’s Cookie Dough – all natural fresh cookie dough ready to slice and cook – made in Glasgow, less than 1 year old. The Chilli Chutney Company/ Muckrach Lodge Hotel – all natural restaurant quality sauces and condiments. Based in Grantown on Spey and only just launching as retail brand. The Ochil Fudge Company – hand made fudge, Scottish tablet, macaroon and honeycomb made in Alva, Clackmannanshire just over 1 year old. Bim’s Kitchen Ltd – African sauces and condiments using ingredients such as Baobab fruit, alligator pepper and melon seeds, along with fresh local produce. Made in Palmers Green, 1 ½ years old. Maha Partnership Ltd – fresh chutneys made to authentic Pakistan and Indian recipes, based in Slough and 8 months old. Norfolk Cordial – all natural, locally sourced fruit based cordials and juices, based in Matlaske, North Norfolk and 1 ½ years old. Patchett’s Confectionery Ltd – all natural, handmade marshmallows, salted caramels and honeycomb – made in Islington and 1 ½ years old. The Celtic Sea-spice Co – seasonings made from hand-harvested natural seaweeds, produced in Edinburgh under 1 year old. Well Seasoned Ltd – British seasonal pestos made from UK grown produce that change with the seasons, made in Park Royal, London and less than one year old. BBC Good Food Show Winter – NEC, Birmingham, 28 Nov – 2 Dec.
Bendylegs – granola made with local, all natural Welsh ingredients in Swansea, Wales – 2 years old. CNWD – smoked meat and fish along with pates and terrines produced using traditional production methods and from local, natural ingredients. Produced in Llanelli, Wales and 1 year old. Forage Fine Foods – uses seasonal, foraged ingredients to make products such as herb and spice mixes, preserves, jellies, syrups and cakes. 20 months old, based in Walterstone, Herefordshire. Meadowsweet Flowers – crystallised fresh edible flowers, along with chocolates topped with crystallised flowers – based in South Molton, Devon and 2 years old. Pig & Co – Sausages, bacon and hams made from free range, rare breed pigs – based in Goostrey, Cheshire and 6 months old. Shropshire Chocolates by Toot Sweets – handmade chocolates made using local Shropshire ingredients. Made in Shrewsbury making her own chocolates for the past 3 years. 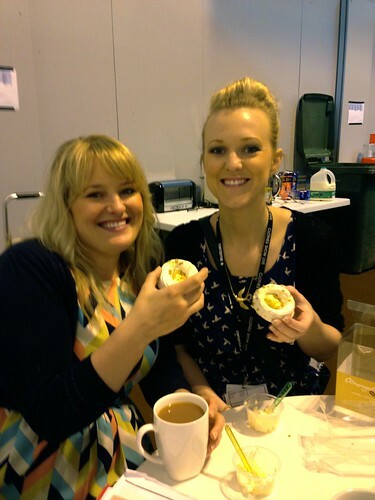 BBC Good Food Show Summer – NEC, Birmingham, 12th – 16th June 2013. Ooomeringues – handmade meringues in allsorts of shapes, colours, flavours and sizes. Made in Newtown, Powys, Wales and 6 months old. Pepper and Stew Ltd – traditional handmade, all natural African cooking sauces made in Northolt, London 1 ½ years old. Saison! – seasoning salts, peppers and sugars made in Dorchester, Dorset 6 months old. Slamseys Drinks Ltd – fruit liqueurs and gins made from fruit picked from her farm and hedgerows – made in Braintree, Essex and 6 months old. I do hope you love them as much as we did and show your support by visiting them at the BBC Good Food Shows!